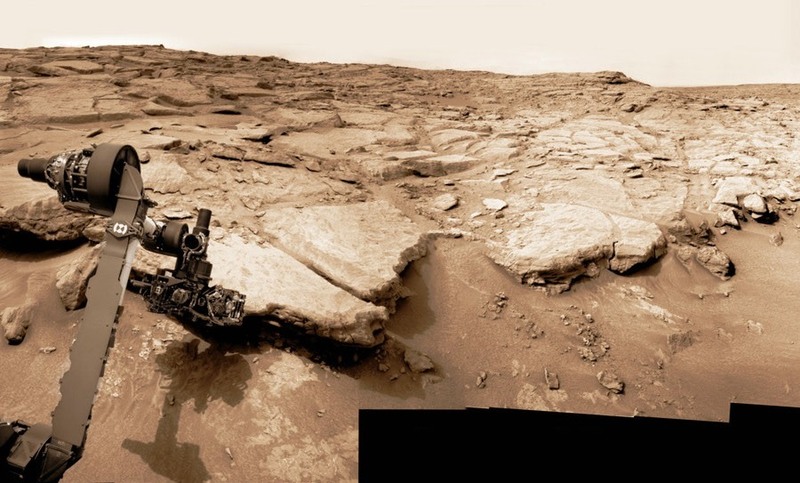 A photographic mosaic shows the Curiosity rover's surroundings at a Martian location known as Yellowknife Bay. This view has been assembled from black-and-white images captured by the rover's navigation camera on Sol 132 (Dec. 19). Gaps in imagery of the Martian sky have been filled in, and the whole scene has been colorized. Click here or on the image to see the complete 360-degree panorama. The cameras on NASA's Curiosity rover have been clicking away over the holidays — gathering enough pictures for a 360-degree panorama of its rocky surroundings at Yellowknife Bay, plus a close-up view showing a "Martian flower" seemingly sprouting from the surface. The panorama was assembled from pictures snapped by the rover's navigation camera system on the 132nd Martian day of Curiosity's mission on the Red Planet, also known as Sol 132 or Dec. 19. In this case, the folks doing the assembling are Ken Kremer, a New Jersey-based journalist, research chemist and photographer; and Marco Di Lorenzo, a physicist who's a high-school educator and photographer in Italy. They stitched together the black-and-white images, filled in the gaps in the Martian sky and colorized the scene to reflect what an observer on Mars might see. We've featured the efforts of Kremer and Di Lorenzo several times before: They're part of an active online community that makes use of the raw images provided by Curiosity and other Mars probes, and then shares them via websites such as UnmannedSpaceflight.com. Even now, the folks at UnmannedSpaceflight are posting plenty of amazing pictures from Yellowknife Bay, including a must-see, zoomable GigaPan version. Another picture from Sol 132 has stirred up some buzz at the Above Top Secret discussion forum. The picture focuses in on a bright, crumpled object that's sitting on a Martian outcrop, as seen by the rover's Mars Hand Lens Imager, or MAHLI. The translucent shape is reminiscent of a flower's pistils, which led one of the forum's members to call it a "Martian flower." An anomalous bit of bright material can be seen left of center in this view captured by Curiosity's Mars Hand Lens Imager on Sol 132 of the mission (Dec. 19). Update for 8:30 p.m. ET: I initially suspected that the flower was a tiny shred of plastic from the rover itself. Such a shred popped up in October. At that time, experts at NASA's Jet Propulsion Laboratory surmised that the plastic may have been a bit of wrapping that was knocked loose from the Mars Science Laboratory's descent stage during the spacecraft's August landing. The plastic was thought to have fallen on top of the rover, and then dropped to the ground weeks later. That's what led me to go with the plastic-scrap hypothesis. However, some of the folks commenting on the pictures noted that the object seemed to be embedded in the rock — which would argue against my hypothesis. So I put in an inquiry with Guy Webster, who serves as JPL's main spokesman for NASA's Mars missions. A couple of hours later, Webster emailed me the verdict: "That appears to be part of the rock, not debris from the spacecraft." Mystery solved? 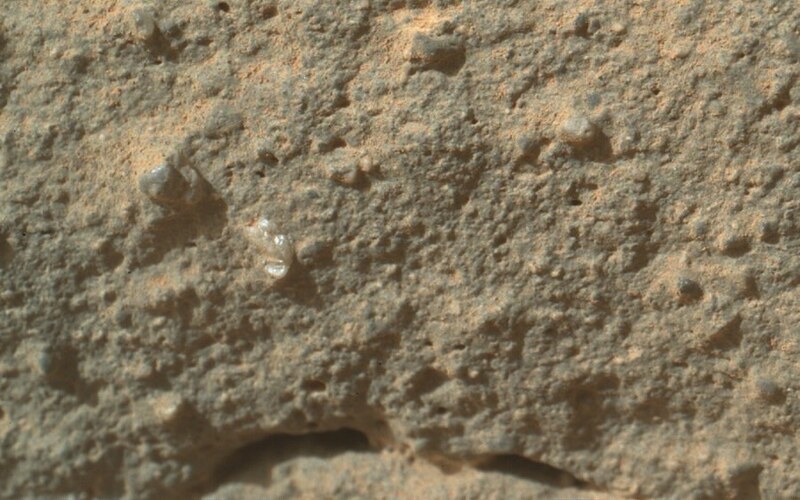 It's certainly an intriguing bit of mineral that stands out prominently in the MAHLI picture. If I find out anything more, I'll be sure to pass it along. And if it turns out that flowers are really sprouting up on Mars, you'll know it's time to cue up the "X-Files" theme. Either way, the truth is out there. 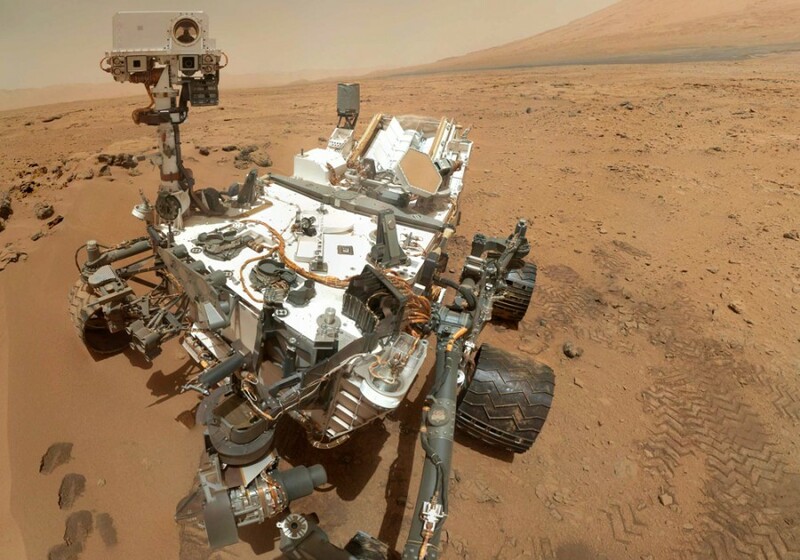 The Curiosity rover has released more images of Mars, including a self-portrait created with more than 50 images. NBC's Kate Snow has more. Alan Boyle is NBCNews.com's science editor. Connect with the Cosmic Log community by "liking" the log's Facebook page, following @b0yle on Twitter and adding the Cosmic Log page to your Google+ presence. To keep up with Cosmic Log as well as NBCNews.com's other stories about science and space, sign up for the Tech & Science newsletter, delivered to your email in-box. You can also check out "The Case for Pluto," my book about the dwarf planet and the search for new worlds. Trace the Curiosity rover's journey to Mars and see the pictures that the six-wheeled robot has sent back from the Red Planet.